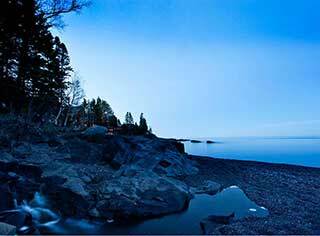 Welcome to Bluefin Bay, the premier Lake Superior resort where you’ll experience up close and personal the very best Minnesota’s North Shore has to offer. 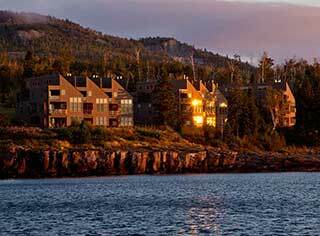 At Bluefin Bay, the outdoors offer access to the year-round playground that is the Lutsen-Tofte region, set against the backdrop of the Sawtooth Mountains and surrounded by the Superior National Forest. The indoors are more enjoyable with upscale accommodations that include in-suite wood fireplaces, whirlpool baths, and breathtaking views of Lake Superior. Whether you select a stunning lakeside suite, multi-bedroom condo, or a guestroom overlooking the ancient Sawtooth Mountains, you’ll get a front row seat to one of nature’s greatest shows. At Bluefin Bay, we bring you closer to the lake, and to each other. Experience upscale hotel lodging in an intimate North Shore setting. Our one or two bedroom guest rooms and suites are a haven for lakeside relaxation, featuring Jacuzzis, pillow-top beds, and stunning views of Lake Superior or the Sawtooth Mountains. Enjoy the comforts of home with the convenience of a ground level or second story studio condominium featuring fully furnished kitchens, living and dining rooms, wood-burning fireplaces, flat screen TVs, and walkout decks or balconies. If you prefer all the comforts of home located right on the waters edge, choose from our well-appointed condominiums or townhomes with fully furnished kitchens, living and dining rooms, and one, two, or three bedrooms. Although no two are exactly alike, each exudes the warmth, comfort and magnificent views you’ve come to expect from Bluefin Bay. Traveling with your furriest family member? At Bluefin Bay, we appreciate all our guests – including the four-legged ones. If your family vacation just isn’t complete without the family pet, you’ll be happy to know your four-pawed pals are welcome in a variety of room styles, including select guestrooms, studios, condos and townhomes. The deck outside our living room was literally 12 feet from the water’s edge. The very large windows provided us with an excellent view and we were very content to just stay in and marvel at what we were seeing.